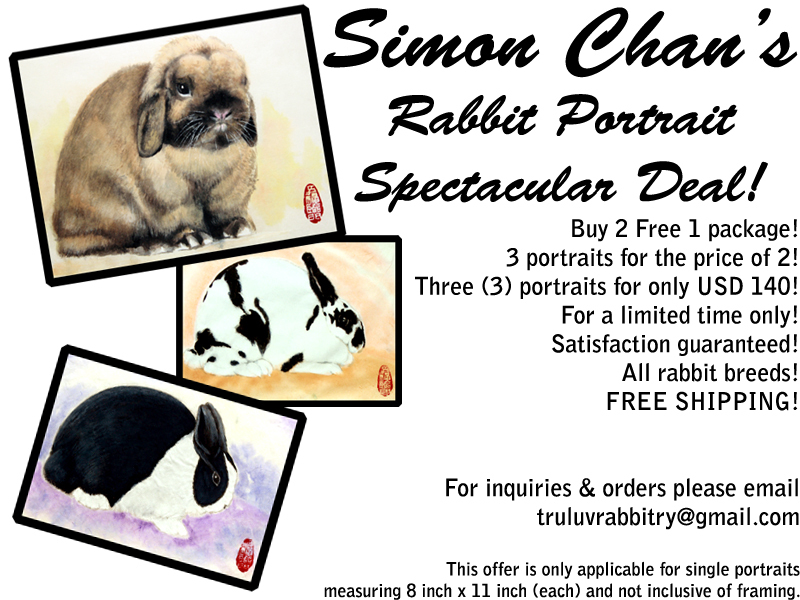 On behalf of my father, I would like to thank The North American Lionhead Rabbit Club for accepting two of his Lionhead rabbit paintings for Auction. Thanks to Patsy Brooks for requesting for them and Dawn Guth for getting them to the banquet. Special thanks goes out to Christine Hutchison for purchasing them and donating them to the ARBA Library. It is a beautiful sign that the Lionheads will make it into ARBA as one of the official breeds and they are here to stay! A huge congratulations to the 2010 National Show Committe, a job WELL DONE! If the human genetics is as simple as rabbit genetics, I believe both my parents have each contributed half their creativity gene to me. 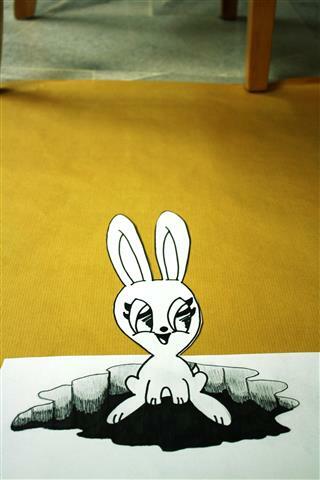 I attribute all the crazy ideas I get while raising Holland Lops from my dad’s artistic traits. As for the problem solving skills, I believe that trait came from my mom. She is a pure innovator I tell you. My dad paints during his free time. 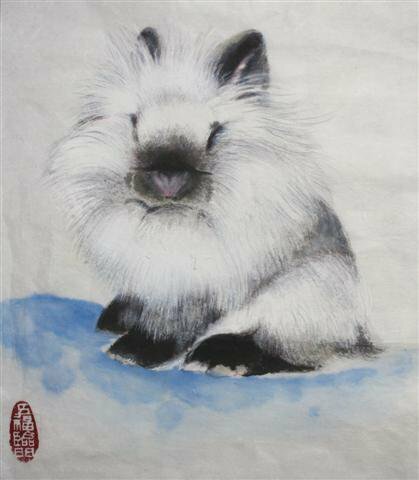 Now he is enjoying his retirement doing what he loves most and to be very specific, Chinese Brush Painting. 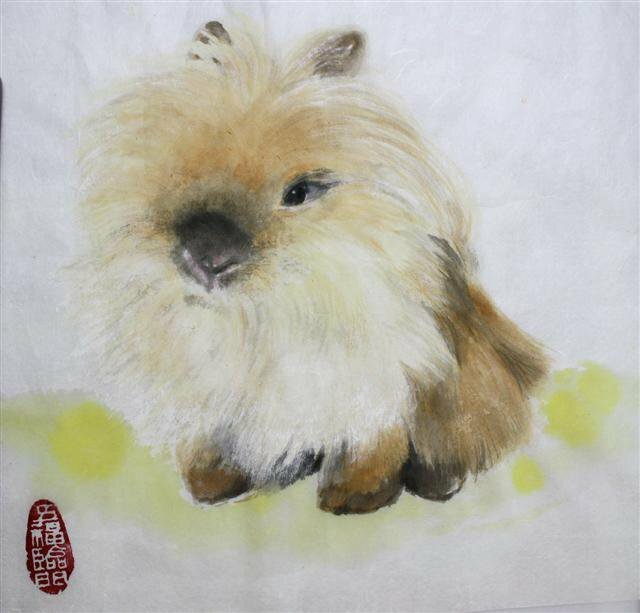 As our culture slowly fades away, so is the appreciation for the Chinese Brush Painting. I must admit that I draw superheroes using pencils and never the brush. It is something that I just couldn’t inherit but I do hope my daughter would be able to pick up the skill. Though painting is just a hobby, my dad has many proud moments in his passion too. He had a few exhibitions in his younger days and his art works appeared on many major dailies. You will most probably see his works during the Lunar New Year. He fills the newspapers with colorful paintings of the year’s zodiac. During the year of the Dog, he drew pedigreed dogs such as Golden Retriever, Boxer and Poodles! Last year, during the year of the rat, he painted a piece that has got 100 Chinese characters denoting the word rat. 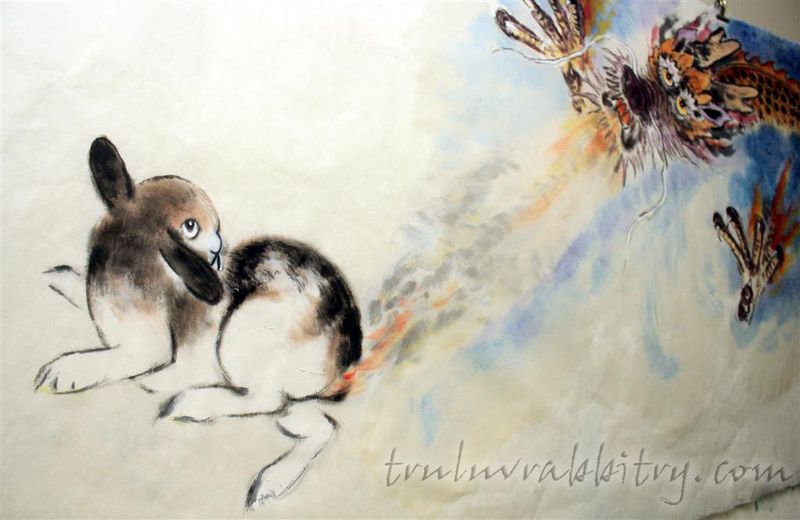 And since we have the rabbit as one of the zodiacs, he painted one with a couple of bunnies too. A Sow & Her Babes. Year of the Boar 2007. While he paints everything with passion, my personal favorite would be his paintings of chickens. His paintings of roosters have a lot of emphasis on the comb. I am particularly drawn to his chicken paintings. Most probably it is because I was born in the year of the Rooster. I find the chicks that he paints rather cute! He now paints exclusively for people who appreciates his work. Most of the time, he paints in accordance to the needs of the requester. Recently, I was inspired to get some paintings done on the Holland Lops. I pestered him to help me paint a few and the results were marvelous! I kept on reminding him to think of bulldogs while he painted my rabbits. Many people have approached him to paint their pets as keepsakes. If you need anything of that sort, please do email me. I’ll be more than happy to hook you up with my DAD! UPDATE: My dad’s weblog is finally up and running. For those who enjoy good art, please visit http://simonchanart.wordpress.com.